Yesterday Tracey asked me, via a comment, how I was going with my granny squares. Well. She need not ask twice. In a background, fortuitous craft sort of way, I am a woman OBSESSED. I’m sticking my hand up for every kid pick-up, on the offchance I can squeeze in a granny round or two while waiting. The Mr has not yet cottoned on to increasingly earlier pick-up times, while I leave him with the other wee ones. Crafty evil, that is. So here’s the state of play: currently sort of patchy on the warmth factor; forty-five-ish down; half with unweaved-in-ends. Mel at M* wrote me my very own detailed and excellent tutorial on how to weave in as you go and I was fully signed up, until I realised the cotton and hook size I’m using means things aren’t covered up or secure enough on the reverse side. Mel, there’s a whole world of the crochet-obsessed, armed with smaller hooks and weightier wool, awaiting your expertise and theories on yarn ends. Finally, there are three hundred-ish of these little numbers required. I have resorted to mass production. In the time it takes to drive down our street (there are speed humps and no, I’m not driving) I can nail the first circle of a granny. I’m carrying one ball of wool at a time and producing six simultaneously, in the same colour configurations. I said I was obsessed. Ok I am going to tell you something if you promise to not get too excited ... I bought a crochet hook about two weeks ago! Not really sure where to start but man oh man I love your wool and I am thinking I might just pop on over to Tam's and find out what all this crocheting fuss is about. Hey do you reckon you can crochet on a plane? Or would the sight of a short woman wielding a hook and a ball of yarn scream TERRORIST? They look fantastic. Go Granny Go. hmmm, are you missing a child, or is that a new beanbag from IKEA!?? Dare I admit it to the open world of Blogland, that the humble granny square has never really done it for me. Having said this, all your squares laid out like that looks FANTASTIC. I may yet be converted! I can't wait to see it all sewn up. There are atleast 8 weeks of school left for the year and if you can squeeze on in every afternoon that's 40, then there are kids sporting activities where you can squeeze a few in as well. You should have all your granny squares done in no time! I'm guilty of all of the above! Ah you crack me up! I'm with you on the 'just in case I have time' theory. I have a ball of yarn and hook in my handbag for those very times. I've even tried to work out if I could crochet and walk to work at the same time... Haven't tried it yet but oh imagine the crochet time I'd have if I could - 1 1/2 extra hours a day! I just love the bean bag photo. If your model is anything like my kids she probably didn't stop reading long enough to even notice your strategic granny square placement. Ok....by this time next year I will have done my first granny square.....I promise!! Those colours are glorious. Long live the under-rated granny square. Cate Blanchett is sobbing with joy right now at the thought of a new dress. Gorgeous photos. Big points to your girl for her patience and tolerance of her evil (crafty evil that is!) mother. Your squares are looking mighty fine. I started my granny rug in October of last year. I have 12 squares. I need to do more pick ups. Maybe I would be more motivated if my squares looked beautiful like yours! I just realised we're both pushing through on a crazy long project, only I don't think I could do Spoonful in the car... damn, think how I could USE all that traffic!! 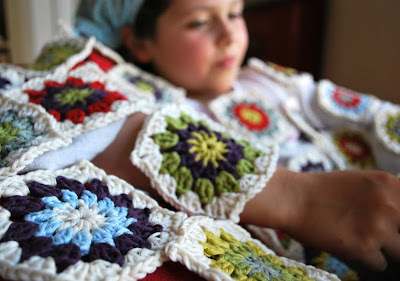 Granny Squares... Two words that should never really be side by side but due to craftiness they are friends for ever!! Those are some mighty pretty squares granny!! Half Australia is obviously now brandishing a crochet hook and , as always , you're leading the field . Those colours are gorgeous ! oh lordie T, I'm just trying to figure out how you drive and craft at the same time without becoming blindingly carsick... knew you were a superwoman. So inspiring! I just might pick up the hook and find some you tube tutorials! Your squares are very beautiful and inspiring too! Ahh, loving your evil! Embarrassed to say I have not started mine yet - still wrestling with a cotton knitting project, making a baby's quilt and hand quilting my own quilt. Oh so tempting though, maybe next week I will have something to show you! OMH, that photo is fabulous, cracked me up! Good goin' with the grannies! You are rockin' those squares girl!!! The picture is too cute. Sounds like you are insanely determined to finish this thing and I am so excited to see it come together. It is lovely!!! holy moly that is a lot of squares! you are very dedicated to your cause! ok you have inspired me i have picked up my crochet hook after years and years, made a flower the other day and thought i was pretty good..... now i'm on the circle in a square blanket bandwagon. i have sat and sat reading the instrutions and i don't get it !!! I love your granny squares, the colours are beautiful. 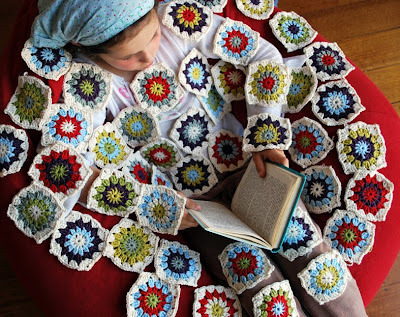 What I love even more, is the child buried under the granny squares, continuing to read. It has that look of a child who is more than used to being 'pinned' and adorned with mum's projects! Great! 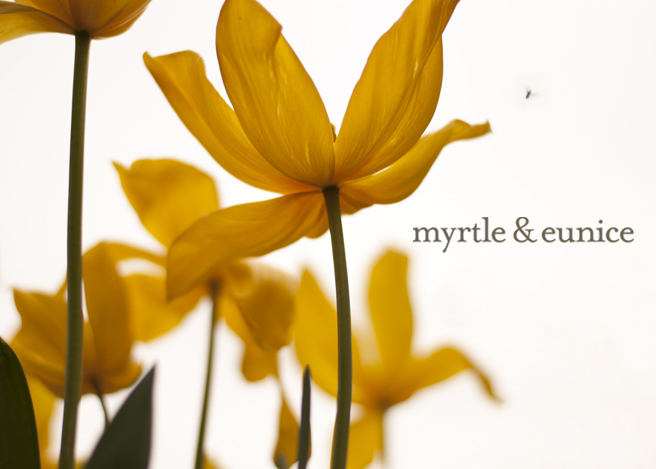 By the way, lovely blog. Ha! Crocheting is pretty addictive like that. I can usually be found carrying around a project...you know...just in case there are a few spare minutes that are begging to be filled. I guess this is were it all starts! Tania you really do have the most amazing eye for colour. Those grannies are stunning. It actually makes me want to learn how to crochet. Well that and the crafty evil of leaving the Mr early with the littlies. Clever. VERY clever. I LOVE IT! Yes I love the colours too...you have reconciliate me with granny squares! OH, lovely! But you HAVE to learn how to weave in the ends as you go. It's just too much of a big task at the end. I did a king size blanket and that's when I realised the importance of it. As I finish every round I weave in before I start the next one. REALLY recommend it. As for Grannies...hmm obsession is only the beginning. I once commented that my house was starting to look like a CWA I have so many granny blankets draped over the couches and chairs. Fortunately my 4 children are totally blanket hogs and it gives me an excuse to make MORE!! !